When Peter stood up to preach that Pentecost morning, he was faced with a challenging situation. 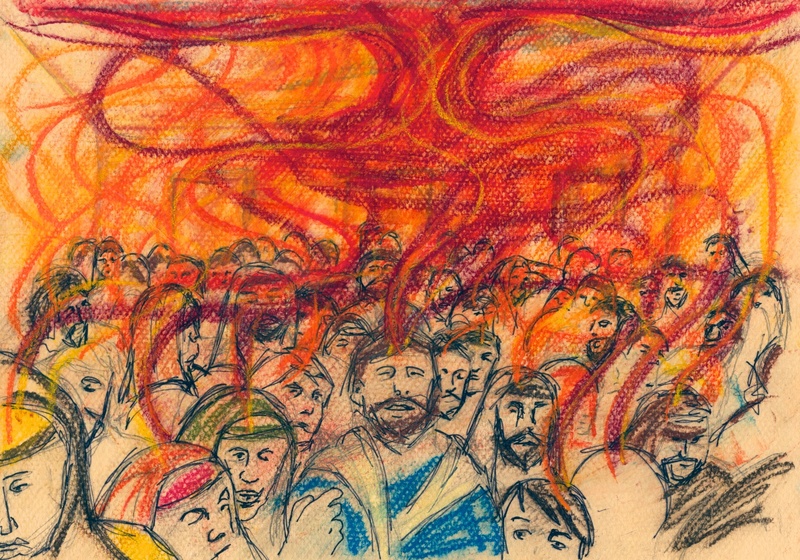 The rushing wind and tongues of fire at Pentecost was one of the most monumental events in history (though admittedly only in the top three of the most amazing things the disciples had experienced in the last two months). The crowd that gathered was ‘utterly amazed’ and ‘amazed and perplexed.’ Some stood in awe, while other stood and sneered. Yet, Peter stood up, raised his voice and addressed the crowd. Peter, whose boldness had gotten him in trouble many times before, now has his boldness directed by the Holy Spirit for the sake of God’s kingdom. Peter, bold and brash, now aims the whole of his being toward the proclamation of the good news. Yet, how does he do this? How, in the light of Pentecost, does Peter proclaim the gospel? There are at least two things I noticed in Peter’s sermon that I think can be helpful for all of us who have been called to be witnesses to Jesus Christ. First, Peter interprets experience in the light of Scripture. His context is the powerful experience of God’s work in the life of the community by the pouring out of the Holy Spirit. However, Peter moves the conversation from the ground of the experience of the community onto the ground of Scripture. Right after he refutes the theory that tongue-speaking issues from drunkenness, he interprets the present reality in light of God’s word. The call for us as witnesses of Jesus Christ is, like Peter, neither to glorify our experiences nor ignore them, but to see them in the light of God’s word. Second, Peter has complete confidence in God’s word to accomplish what God wants it to accomplish. If you do the math on Peter’s Pentecost sermon, you will find that 43% of the words come directly from Scripture. More than two out of every five words in his sermon are from the Old Testament. In the face of a large, bewildered crowd and the fire of Pentecost, Peter places his trust in God’s word to accomplish God’s purposes. He doesn’t get fancy or cute, he points to Jesus Christ – crucified and risen. And it turns out the Holy Spirit was at work. The people were ‘cut to the heart’ and 3000 believed that day. There are no fool-proof formulas to make your church grow or help your friends and neighbors know Jesus Christ. But, I believe that Peter’s Pentecost sermon points us back to God’s word itself as the foundation for proclamation. In our preaching, our teaching, our evangelism, and our discipleship, we should be confident that God still speaks through His word and that the Holy Spirit still uses Scripture to cut people to the heart and turn them to Christ. It is not a formula, but it is good ground to stand on as we bear witness to Jesus Christ. right. This publish actually made my day. You cann’t consider just how much time I had spent for this information! Thank you!